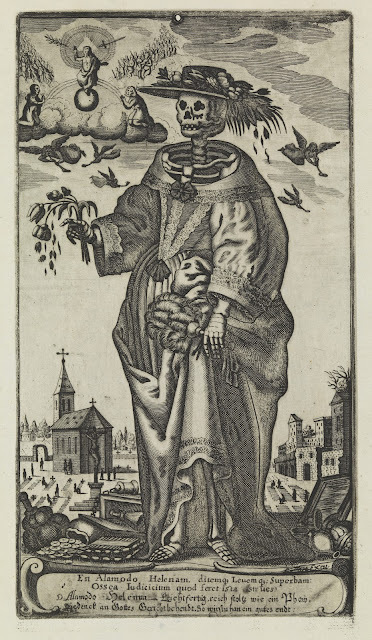 The memento mori pictures in the Wellcome Library range from complex and learned allegories to popular works which encourage their owners to laugh in the face of fate. A comparable collection, focused on the Dance of death, was acquired by the late Professor Hans Schadewaldt (1923-2009) for the Institut für Geschichte der Medizin at the Heinrich-Heine-Universität Düsseldorf, and has supplied material for several exhibitions and studies. As this posting will show, the Wellcome Library’s pictures, like the Düsseldorf collection, also provide a continuing stimulus to new interpretations; the opportunity to preserve rare works from destruction; and a context for new accessions. They also contribute to the study of a subject — attitudes to death — which (one might surmise) is manifested in cultural objects in every country on earth. 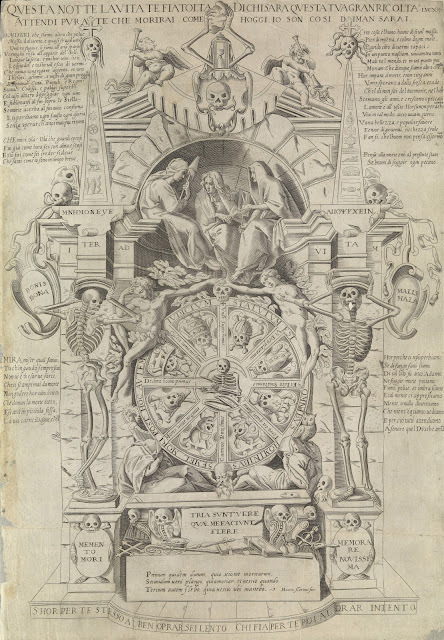 One of the most elaborate of these documents in the Wellcome Library is the chiaroscuro woodcut from 1588 shown here. It depicts a complex monument to death, with, in the centre, the three Fates weaving the thread of life, and below them a wheel of death. At the bottom is a sarcophagus, and all around mortality-motifs are artfully disposed: they include skulls, obelisks, Father Time, Adam and Eve, and relevant mottos. The woodcut is attributed to Andrea Andreani (1560-1623), an artist who worked mainly in Mantua and Siena. It bears his faint AA monogram in the lower right corner: it is faint because it is printed in the tone colour used on only one of the two blocks on which the design was made (one block for each colour used). That may be a way for Andreani to declare himself one of the few masters of the art of the chiaroscuro woodcut, as indeed he was. Who was the author of this extraordinary composition? Not Andreani, who was a woodblock-cutter. There is a dedication in the lower left corner to one Pietro Cavallo by Giovanni Fortuna of Siena (1535-1611), and this inscription also names him as the designer. He is known to have practised as a goldsmith in Siena. If he produced this design for execution by himself in metal, as an object of virtu, he must have had a rare ability. 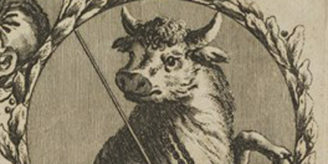 However he may have produced it as a design for an engraving, for another version of the composition exists in the Wellcome Library as an engraving (with etching), perhaps by Fortuna himself (image above). (The link between the engraving and the woodcut was first kindly brought to the Wellcome Library’s attention by Malcolm Jones, and confirmed by Giulia Bartrum of the British Museum.) There are differences. The engraving has extensive lettering in Italian verse, lamenting the mortality of mankind: none of these is in the chiaroscuro woodcut, where only Latin and Greek are used (following the Latin and Greek wording on the engraving). That suggests that the engraving was produced for a more popular market, and the woodcut for the elite. The drawing in the engraving seems less competent: this could mean that it is by a less skilled artist copying Andreani’s chiaroscuro woodcut, or conversely that Andreani smartened up Fortuna’s draftsmanship when he cut his woodcut, if Andreani was the copyist. A detailed examination of the two prints would be necessary to elicit the sequence of events. 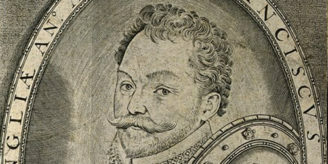 The engraving appears to be very rare, and the Wellcome Library’s impression survived until recently as a somewhat crumpled sheet with frayed edges (image right). Its rarety was a factor in the decision to conserve it last year. From the contrast between its state before and after conservation, readers will appreciate the improvement achieved by the Wellcome Library’s conservator, Luana Franceschet. One of the memento mori-subjects depicted in the Fortuna prints is the three Fates, who sit in a kind of grotto within the arch. They are the subject of a painting on wood (above) contemporary with Fortuna’s composition. It shows the three Fates of Greek and Roman mythology: Clotho, Lachesis and Atropos. Clotho (“spinner”) in the centre distributes the fibres from a distaff. Lachesis (“Allotment”) on the right measures out thread on to the spindle, the length of the thread corresponding to the lifespan of a given person. Finally, Atropos cuts the thread at the moment of death with a large pair of shears: her name means “No turning back”, because once the thread has been cut, it cannot be uncut. 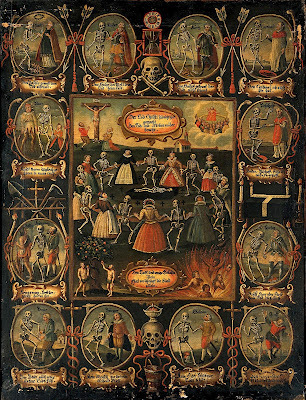 This painting, assuming as it does a knowledge of Graeco-Roman mythology, is an example of the type of memento mori picture designed to appeal to erudite taste. Features of the picture typical of “mannnerist” paintings of the later sixteenth century also imply an aspiration to the culture of Italy, Haarlem, or Prague: they include the silvery flesh-tones of two of the Fates, the contorted postures, and the “rosy-fingered dawn” (or dusk) in the left background. One of those less sophisticated parts of the world was England, and one can easily imagine the present painting proudly displayed in a wealthy house in Shakespeare’s England. English painters of the time (and other artists such as cabinet-makers and plasterers) were heavily dependent on Flemish models, and had little or no first hand knowledge of such masters of artistic anatomy as Michelangelo and Raphael. Another part of the world where Netherlandish models of mortality were used by painters was Bohemia, as is shown by a remarkable current exhibition in the Loreto pilgrims’ centre in Prague. In the church of that complex–the Capuchin church of the Holy Nativity–wall paintings on the themes of death and resurrection have been discovered in a hitherto unknown space in the crypt. 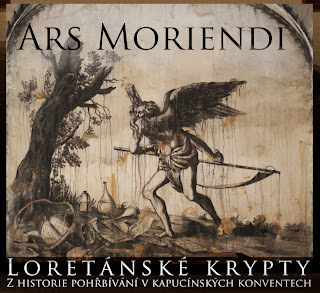 The paintings were commissioned around 1664 by the then patroness of Loreto, Countess Elisabeth Apollonia of Kolowrat, and may have been painted by a Capuchin monk, copying Dutch and Flemish engravings of the Grim Reaper and similar themes. The crypt was discovered as a result of a mistake: researchers were looking for a documented crypt which was actually in a completely different building! Though the Loreto crypt itself cannot be opened to the public, an exhibition including a walk-in reconstruction of the space is on show until 30 September 2012*. A book  has also been published about this unexpected discovery, and a short virtual visit to the crypt is available online. Engraving by Gerhard Altzenbach, 16–. Wellcome Library no. 803817i. 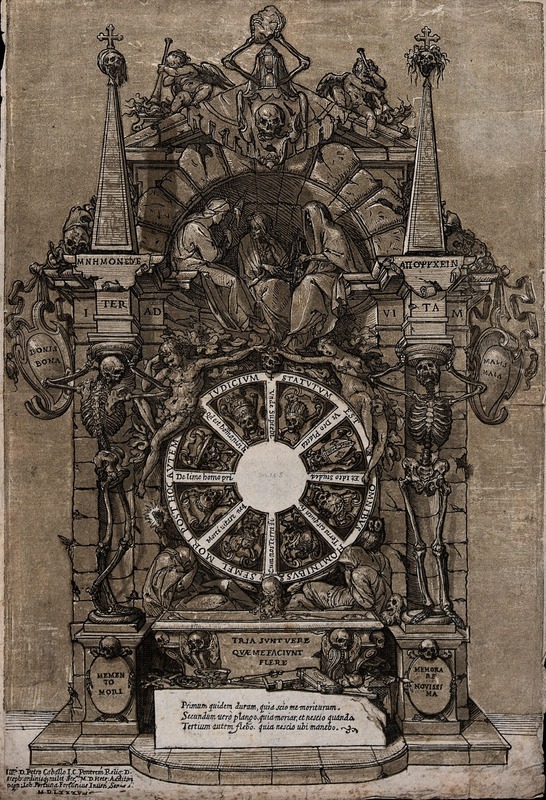 Among the Wellcome Library’s memento mori prints are two by Gerhard Altzenbach who worked as an engraver and publisher in Cologne in the mid-17th century. The Wellcome Library recently had the opportunity to acquire a third print by the same artist, showing a skeleton as a fashionably dressed woman. The verses below mock her as a modern Helen of Troy, who needs to think more of her soul: in the top left corner, the Last Judgment, with the Virgin and Jesus Christ intervening before God on behalf of the saved, are intended to remind viewers of the fate of everyone, however “fashionable, rich, capricious, and proud”. The print is actually one half of a pair, the other showing a foppish man addressed as Paris, the male counterpart to Helen. Many memento mori prints use ideas derived from the mediaeval theme of the Dance of death, often mediated through the woodcuts of the subject by Hans Holbein. It is remarkable how adaptable this theme has proved. Some artists have taken whole Dance of death and have set it in their times, while others have taken a traditional episode from the Dance of death and have treated it in their idiosyncratic style. 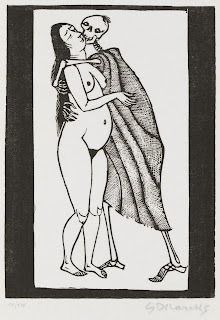 Examples of the former are the series Ein neuer Totentanz (1947) by the Austrian Alfred Kubin, based on drawings executed in 1937-1938, and The dance of death modernised, a large etching (image above: sheet 56.8 x 72 cm.) by Isaac Cruikshank, 1808, after designs probably made by by G.M. Woodward about a decade earlier, ca. 1795/1797. The latter contains twenty-four Georgian figures arranged in four rows, starting at the top left with a king and Catherine the Great of Russia (1729-1796), implying that Catherine had recently died: in vain she retorts to Death “Fellow!—I am an Empress!”. It continues with a parson, a lawyer, a physician (“Here’s fine encouragement for the Faculty!”), a retired prostitute with syphilis, a gouty old man, etc. 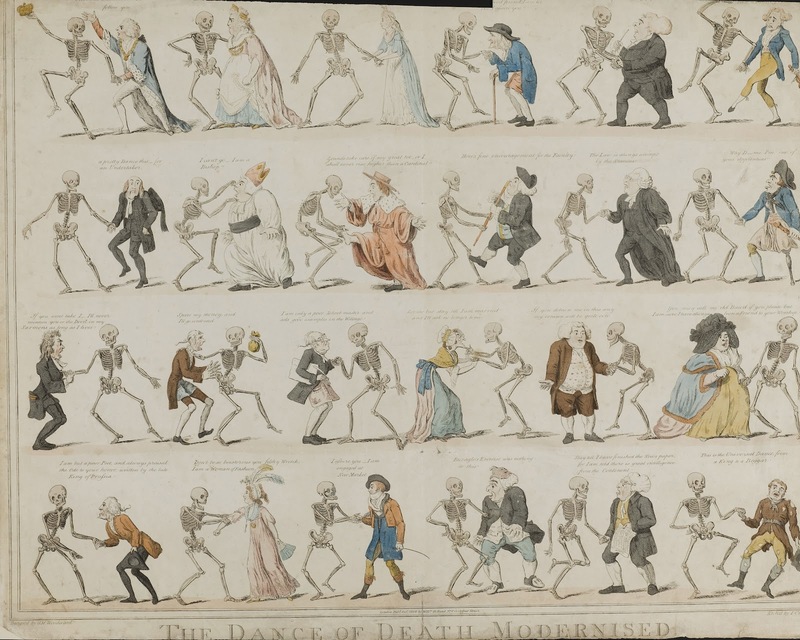 Readers who have read this far share an interest in the iconography of death with Tim Knox, Director of Sir John Soane’s Museum in London, who has described his new hobby: perusing the Your paintings database for “Morbid discoveries“, paintings of deathly themes. Referrring to the Wellcome Library as a “fathomless reservoir”, he draws attention to three Wellcome Library paintings on the subject of mortality (not the same pictures as any reproduced here), as well as to some grand history-paintings of death worth knowing about in other British collections, from Glasgow in the north to Dartmouth in the south-west. Another scholar who shared the same interest was the physician Frederick Parkes Weber, the author of a substantial “anthology and iconography” entitled Aspects of death and correlated aspects of life. As Weber was born in 1863 and died in 1962, Lachesis must have drawn out a particularly long piece of thread at his birth for Atropos to snip at just short of the 100-year mark. So great is the theme that any shorter lifespan is scarcely sufficient to get to grips with it. e.g. Zum Sterben schön: Alter, Totentanz und Sterbekunst von 1500 bis heute, edited by A. von Hülsen-Esch and H. Westermann-Angerhausen together with S. Knöll, Regensburg: Schnell + Steiner, 2006 (find in the Wellcome Library here). Frederick Parkes Weber, Aspects of death and correlated aspects of life in art, epigram, and poetry : contributions towards an anthology and an iconography of the subject. 4 editions (1910, 1914, 1918, 1922). Find in the Wellcome Library here. *STOP PRESS: the Prague exhibition has been extended to November 2012. They’ll be hard put to find a more absorbing offering than this one!